company has grown from a husband and wife business, and Kootenay Forge has now passed into the capable hands of John’s daughter Gina and her husband Cory. Kootenay Forge is a member of The Artisans of Crawford Bay, a group of eight craft businesses that are all located in the tiny hamlet of Crawford Bay. We are blacksmiths (that’s us), weavers, wood carvers, copper enamelists, broommakers, potters and jewelers. Visit us at artisansofcrawfordbay.com We welcome visitors, by car or computer! Blacksmithing is the original craft of working with iron, going back 3,500 years. Although the tools have changed over the years, we still follow in the footsteps of the blacksmiths of old, using many of the same techniques. With small, energy efficient propane forges, we heat the steel to 2,000 F (1,200 C) and hammer, bend and twist it into all the beautiful shapes you see here. We use a few modern tools, but it’s with hammers that we forge life into the red hot steel, and the ring of the anvil is music to our ears. We are a small business, and our vision has always been to produce ironwork of superior functional and aesthetic value. 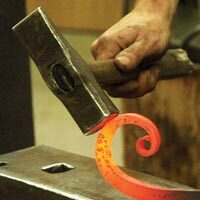 Blacksmithing is very labour intensive, requiring considerable training and practice. When you purchase a piece of our forged ironwork, you are supporting a company that firmly believes that human skill and satisfaction will always be more important than all the technology in the world. Hand Forged Home Accessories from Kootenay Forge!